It’s another pleasant surprise! Direct Auto & Life Insurance wants you to be in control. Manage your insurance policies anywhere, anytime using the new and improved MyAccount. It’s sleek, it’s modern and it’s easy to use wherever you go! 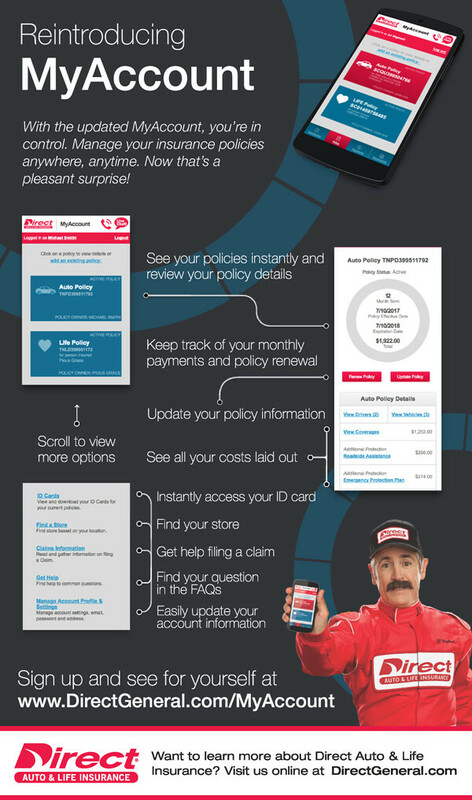 Check out all of the features in our handy dandy infographic below! Login to MyAccount HERE and take it for a test drive using the information below! Have more questions? Check out our MyAccount FAQs page on our website or visit our learning center to read “Your Guide to MyAccount.” Login and register for MyAccount HERE! With the updated MyAccount, you’re in control. Manage your insurance policies anywhere, anytime. Now that’s a pleasant surprise!